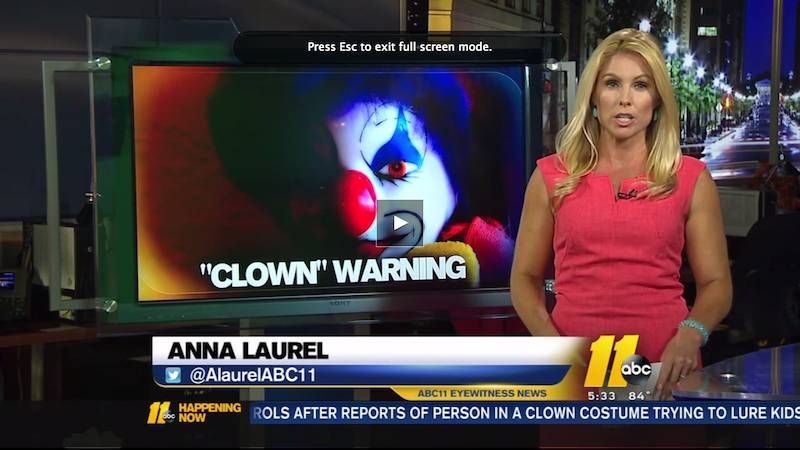 A person (or persons) dressed as a clown is reportedly posing a threat to the child residents of wooded towns in both North and South Carolina. A clown, and authorities are unclear if it’s the same one, was also reportedly spotted again later that night. The strange incident follows accounts of a similar spotting on Sunday in Winston-Salem, North Carolina and in Greenville, South Carolina last week. Similar to what witnesses told police last week in South Carolina, the suspect in Sunday’s incident in North Carolina allegedly tried to lure the kids with treats. The suspect was reportedly seen by two children and heard, but not seen, by one adult. The suspect fled the area when officers arrived, WTVD reported. The “clown” had on white overalls, white gloves, red shoes with red bushy hair, a white face and a red nose, witnesses told police. Cops have since cautioned residents in the area to be aware that “although it is lawful to dress as a clown, given the heightened tensions about these entertainers, officials are discouraging ‘copycat’ behavior by individuals who may find it humorous to mimic suspicious behavior.” That’s... the definition of a clown.